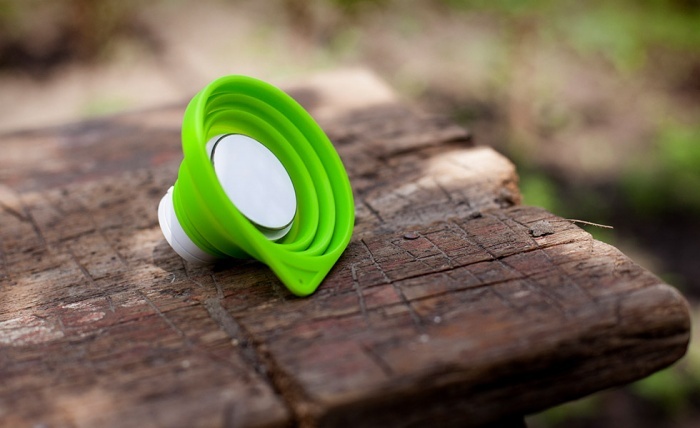 Small Speaker, Great Sound: Aiia Ssssspeaker | OhGizmo! Big sound, small speakers. That’s probably what best describes the Aiia Ssssspeaker. At first glance, the speaker with the unusual name doesn’t really look like much of a speaker. In fact, it probably looks more like a hockey puck when it’s not in use. But pull the collapsible cone out from the base of the speaker and get ready to get lost in your favorite tunes. One major downside? Aiia isn’t built with Bluetooth so you won’t be able to hook it up with your music player or smartphone wirelessly; instead, you’ll have to hook it up via the 3.5mm auxiliary port.